Louisiana State University shouldn’t replace Mike the Tiger. Louisiana State University’s beloved mascot, Mike the Tiger VI, just died. This time, they shouldn’t replace him. Rest in peace, Mike the Tiger VI, here in his habitat on Aug. 25, 2008. On Tuesday, Mike the Tiger VI, the live tiger that served as the beloved Louisiana State University mascot, succumbed to cancer at the age of 11. The death was sudden, coming less than a week after doctors rediscovered tumors thought to be slowed by radiation treatments at one of Louisiana’s top cancer hospitals. However, before Mike the Tiger VI had even passed, and before the community could mourn its mascot, LSU officials announced that they had begun the search for a tiger cub to replace Mike VI. And you know what? No one should. LSU teams have been nicknamed the “Tigers” since 1895, when the school’s first-ever football coach, Charles E. Coates, chose to honor the common Civil War nickname for Louisiana troops. He declared the school’s colors, purple and gold, “looked Tigerish enough.” The school has used live tiger mascots since 1936, when athletic director Chellis “Mike” Chambers bought a young cat from Arkansas’ Little Rock Zoo for $750. The Mikes seem to have been well-loved by the LSU community. But even LSU students, arguably the ones who have the most to gain from this arrangement, are questioning whether the school should continue the tradition of keeping exotic tigers captive for their own enjoyment. An online petition set up by LSU alumna Andrea Amar asking the school to end the practice of using live tiger mascots has received more than 115,000 signatures from around the world. (A competing petition, asking that Amar’s petition be negated, has, as of this writing, two signatures.) That’s a discernable difference from a similar conversation that surfaced in 2007, after Mike V died. Of course, that campaign was led by People for the Ethical Treatment of Animals and was perhaps more easily brushed off by the university—in fairness, what doesn’t PETA complain about? No one is saying that Mike the Tiger VI wasn’t properly cared for. He lived in a nearly $3 million dollar enclosure on the LSU campus, complete with a waterfall, live oak trees, and, as repeatedly mentioned on the school’s website, a backdrop of Italian architecture, which I guess is nice. LSU veterinary students sculpted him impressive birthday cakes and portraits entirely out of meat. Before home games, Mike would be trailered around the field to a stadium of screaming fans, while cheerleaders performed on top of his cage and Survivor’s “Eye of the Tiger” blared from stadium speakers. Majestic, truly. The school, for its part, says that it never sedated Mike during games and would bring him to the stadium only if he entered the trailer on his own. From 2007–2013, Mike was a pretty good sport, attending 32 of 43 home games. “If he seems relaxed while in the stadium,” said Ginger Guttner, of the LSU School of Veterinary Medicine, “it’s because he’s comfortable in that environment.” In the past few years, his willingness to get in the trailer dipped dramatically. In 2014 he attended no games, in 2015 he made it to one, and this year his illness precluded his attendance. 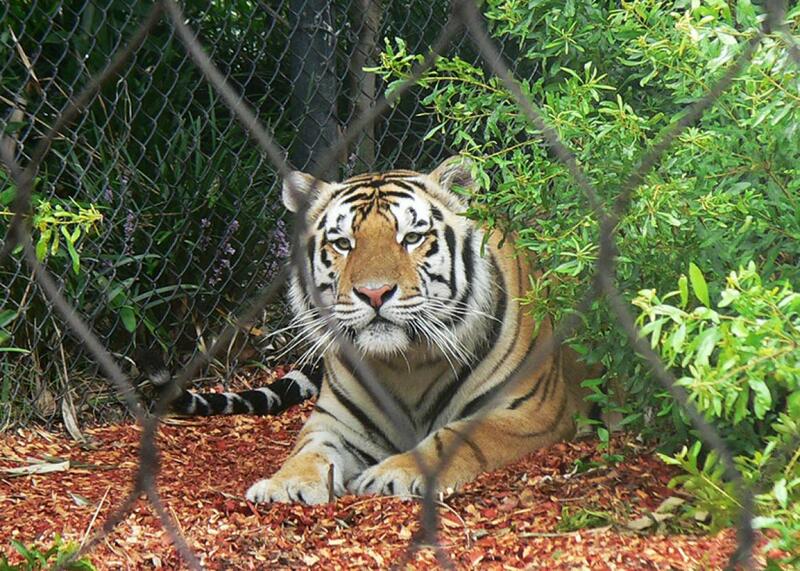 LSU is searching for a young tiger, currently living in a rescue facility, that could be donated to LSU. LSU will not engage in breeding tigers to obtain a mascot, nor will LSU purchase a tiger. Instead, LSU is seeking to adopt a tiger that is already living in captivity in the U.S. and give it a better home. LSU’s tiger habitat is 15,000 square feet, includes grass, trees and a pool, and is on par with tiger habitats at the nation’s top zoos. LSU’s mascot receives top-notch care through LSU’s School of Veterinary Medicine, and the mascot only attends football games when he chooses to enter his mobile trailer. Mike VI received an estimated 100,000 visitors each year at his habitat, and through those visits, LSU aims to inspire respect for tigers and awareness of their plight in the wild. It sure sounds like Mike VII will have a pretty good life. Perhaps even better than most wild tigers! It’s not pretty out there: Tigers are the largest of the cats and may have recently been the absolute pointy pinnacle of the food chain, but that’s before humans started using weapons. Since then they’ve had a rough go of it. Once ranging nearly all across Asia, the wild tiger population now numbers fewer than 4,000. Habitat loss and poaching continue to push tigers towards extinction. If anything, why not give a tiger a chance to live Mike’s life? After all, the health of wild animals is not affected by any one individual’s life or death. Instead it’s the entire population’s ability to survive and reproduce that matters for sustainability, and one captive tiger will have little to do with that. Plus, there’s plenty of precedent in the wide spectrum of American universities that keep live animal mascots, though the job difficulty seems to vary: Some mascots just hang out on the sidelines, looking adorable. Some animals are more active participants, like Colorado University’s Ralphie the Buffalo literally leading the charge onto the field. (That video is terrifying.) Some just stand around dumbly, because they’re goats. But are these reasons enough when we’re talking about an endangered animal? The primary criticism of LSU’s continued use of live tiger mascots was that the new Mike might come from a captive breeder. These “roadside zoos” or other disreputable facilities are not good: They don’t treat animals well, and their existence encourages poaching tigers from the wild. Indeed, the Indiana nonprofit that supplied Mike VI to LSU in 2007, Great Cats of Indiana, had been called a “death camp” for big cats and was closed in 2014 by the U.S. Department of Agriculture. LSU will likely be acquiring a tiger that was once used for public handling. A number of tiger breeders produce a steady supply of cubs that are used for photo ops with the public and then dumped when they’re about four months old. LSU may be fueling an industry that tears newborn cubs from their mothers, feeds cubs a nutritionally deficient diet, uses physical abuse to control them, and then discards them when they’re no longer useful. LSU’s statement is quite nearly a boast about its superior tiger-hosting amenities—it’s cage is more spacious, and don’t forget that Italian architecture imagery and the meat cakes. But while that sounds nice, it’s a human-centric approach to measuring what benefits a tiger. And, as Leahy notes, its existence still perpetuates the myth that people should be able to own these endangered animals, which is not a great look if we’re trying to shut down commercial trade. LSU claims that hosting Mike increases respect for tigers in the wild among the 100,000 annual visitors it receives, but research is pretty murky on whether zoos actually succeed in educating their audiences about the importance of conservation or biodiversity (OK, LSU is not technically a zoo, but the intent here is the same). And though the university has used Mike’s quarters to conduct research on microbiomes in the past, this line of study requires data from many mammals to be substantive. There’s very little you could learn from one individual tiger that could matter for tigers at large. (Plus, the researchers seem adamant that they’d only collect samples from Mike’s surroundings, not from Mike himself.) It would be tough to argue that not having one single captive tiger on campus would derail the university’s tiger research in general. So what should LSU do? The Humane Society isn’t actually against the practice of universities using live mascots in general, it’s just opposed to the encouragement of improper breeding and the stress imposed on wild animals from the gameday atmosphere. (More common animals like dogs and goats are OK as long as they’re not stressed, and to be frank, if you’re going to take a stand against keeping these creatures captive, you’ve got bigger problems than mascots.) Plus, there’s actually a good solution if your mascot is more exotic: The Humane Society is “absolutely OK” with mascots that are kept in accredited zoos or sanctuaries. For example, the University of Houston has Shasta VI, a cougar that is kept permanently in the Houston Zoo and appears at games via webcam. This is a good way to maintain the educational benefit of helping students associate their cartoon mascot with the real thing. That could help inspire the students involved in actual advocacy work, such as with the Tigers 4 Tigers groups that exist at LSU (and elsewhere), to stick with it. In the end, LSU should pass on acquiring another Mike simply because there is really no reason why LSU needs to have one of its own and plenty of reasons why it shouldn’t. If LSU and schools like it really wanted to honor their namesakes, they’d put real money and effort into protecting habitat for wild tigers, ensuring that the spirit lasts longer than a football season. And if the university must have a tiger on the field, stick with a kid in a giant furry costume. They cost less to feed and house, and they’re much, much better dancers.